The Micro Dispensing System MDS 3020+ stands for most flexible dispensing of low and medium viscosity fluids. The highest precision system MDS 3020+ dispenses minimal amounts in the nano- and subnano-range and is suitable for a vast amount of demanding industrial applications. The MDS 3020+ Series offers a number of major advantages, including modular design, real-time setting and easy maintenance. The modular design of the MDS 3020+ systerm and the freely adjustable parameter settings enable a flexible use with fluids of low and medium viscosity. It also allows the creation of user-defined configurations with a variety of nozzles and fluid boxes for each media and dot size. 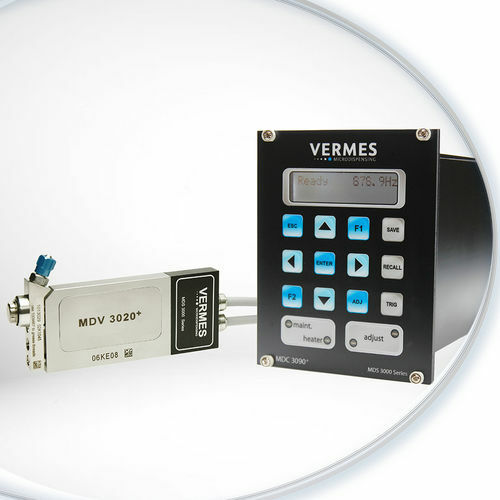 The systems's controller MDC 3090+ is also compatible with all valves of the MDV 3010 and the MDV 3020 series. The piezo technology accelerates the dispense cycle with extremely fast opening and closing times of the valve that results in highest throughput and enhanced system performance. The system performs complex dispensing patterns, dispenses lines with different widths, immediate change of drop size and speed. It dispenses several hundred shots within a second, and this with very high repeatability precision of drop-to-drop dispensing to a viscosity of 8,000 mPas.